The Bellagio Hotel Las Vegas embodies Vegas luxury designed in exquisite Italian style, living up to its reputation as a first class resort. This extravagant Italian villa features an elaborate courtyard with five swimming pools, gorgeous sculptures, and elegant fountains. 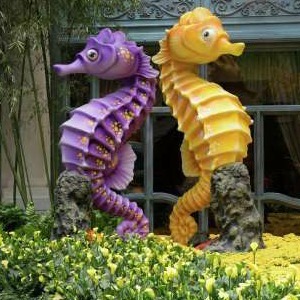 The Bellagio Resort overlooks an eight acre lake featuring a magnificent display of dancing fountains. 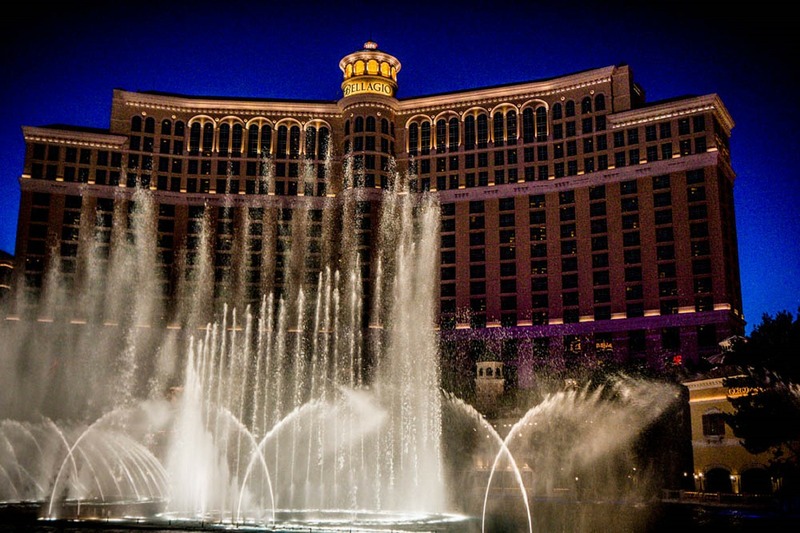 The central location on the Strip (across from Bally’s and Paris Hotel Las Vegas), makes booking a room at the Bellagio Hotel Las Vegas an ideal choice for easy access to the best attractions and entertainment Vegas has to offer. Elegantly designed guest rooms and suites feature contemporary European-style furnishings, marble bathrooms with soaking tubs and separate glass showers, decadent beds, and high-tech amenities. Guests enjoy formal room service, access to a top-notch fitness center and spa, world class dining options, and unique attractions such as the dancing fountains and indoor botanical gardens. For a first class shopping experience, explore the designer boutiques and signature shops at The Shops at Via Bellagio. Bellagio rooms and suites allow you to customize your stay with mood lighting, individual climate controls and reading lights, plus automatic drape and sheer controls. Fountain View Queen Rooms offer beautiful vantage points of the famed Fountains of Bellagio with the stunning backdrop of the Las Vegas Strip. They are located in Bellagio Tower's North and South Wings with double Queen sized beds. Resort Queen Rooms were inspired by the Conservatory & Botanical Gardens. Enjoy welcoming butterscotch tones and luxurious furnishings; experience a fresh, natural aesthetic—along with the most modern of conveniences. Resort King Rooms, inspired by the calm stillness of nature, and Bellagio’s Conservatory & Botanical Gardens, feature serene views of the mountains. Rooms are decorated in palettes of either gentle green tea and plum, or a chic indigo and platinum. Resort Tower King Rooms are designed with the aesthetics of nature and the philosophy of well-being. Enjoy a little more space to unwind and panoramic views of Las Vegas. The Salone Suite is a lush, peaceful haven designed with a focus on Italian-inspired clean lines and fine details. This Suite features a marble foyer, an inviting living area and an upgraded bathroom with a whirlpool tub, separate shower and couples’ sinks. 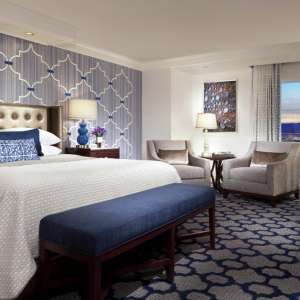 The Bellagio Suite is spacious, with art-themed interiors and views of the Las Vegas landscape, and may be connected to a Tower Deluxe Guest Room for an even larger, residential-style suite. This Suite has a separate living room and bedrooms, powder room, and couples’ baths – one with a steam shower and the other with a soaking whirlpool tub. 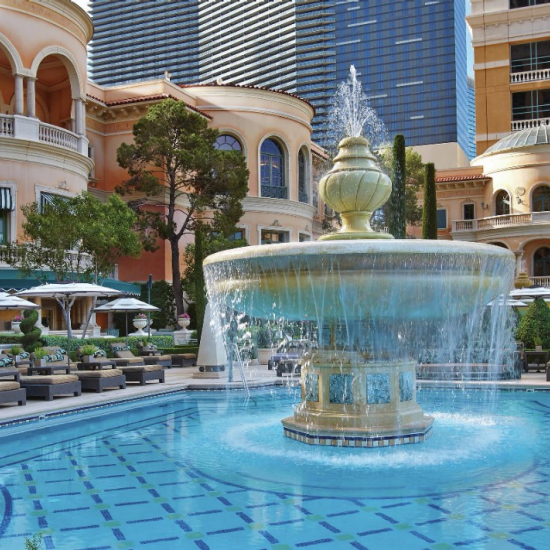 Bellagio offers an award-winning beauty oasis with the singular goal of pampering you. Spa Bellagio promises the spa & salon services will restore, revive, and replenish you with a unique menu of international treatments in a luxurious 65,000-square-foot setting. Keep in mind: Spa Bellagio takes reservations three months in advance. It is suggested that you make your reservations as far in advance as possible due to limitations on select appointments. The Fitness Center is where you’ll find the latest equipment along with experts who will assess your long-term goals to help you implement an exercise regime tailored to you. Also, enjoy a wide spectrum of classes to get your heart pumping. Five pools are located in the courtyard, as well as Spas, a garden vista café. Lounges, daybeds, and private cabanas are available by reservation, as well as poolside massage treatments. Note: Must be 14 years of age or accompanied by a parent or guardian of at least 18 years. Pool Cafe - The Pool Café offers menu options for breakfast and lunch, and a variety of handcrafted cocktails and refreshing coolers. Pool Bar - Enjoy liquid refreshments poolside. Cocktails are created from the freshest ingredients that are made from scratch daily. The Shops at Via Bellagio offer a first class shopping experience. The glass enclosed shopping promenade is open daily from 10:00 am to midnight. From designer boutiques to Bellagio signature shops, you are sure to find something to suit your taste. 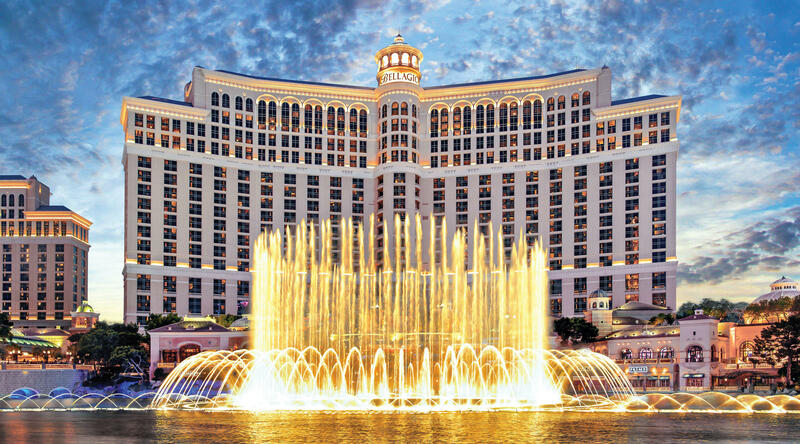 The Concierge at Bellagio can assist you with booking tee times, dining reservations, show reservations, transportation requests, Spa and Salon Appointments, recommending special gift ideas, floral arrangements, and answering general questions. Bellagio Las Vegas offers Proposal, Renewal of Vows, and Wedding packages that are designed to take care of every detail. There are five beautiful venues available to choose from. 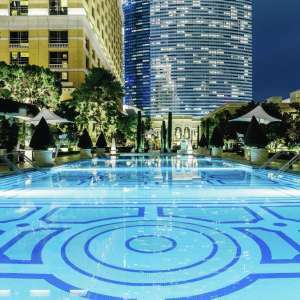 The Bellagio Hotel Las Vegas offers 19 restaurants with a variety of dining options - everything from the finest cuisine to casual poolside fare. 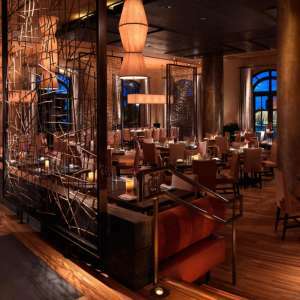 There are two AAA Five Diamond restaurants: Chef Julian Serrano’s celebrated Picasso and Le Cirque. It is recommended to make reservations prior to you visit. Innovative dishes from traditional and contemporary Japanese cuisine paired with a selection of specialty sakes and panoramic views of the Fountains of Bellagio. Menu features Cantonese, Szechwan and Hunan cuisine in a beautiful garden and lake-view setting. 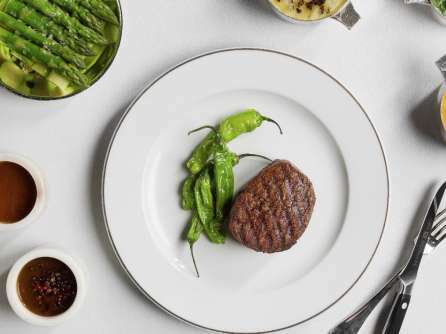 Celebrity chef and restaurateur Jean-Georges Vongerichten has created steakhouse dining at its finest. Savor prime steak, seafood and lamb. Surrounded by exquisite décor with a view of the Bellagio fountain, you’ll enjoy Chef Serrano’s menu of creative, signature flavors. Sustainable and seasonal dining, Chef Roy’s market-inspired menu delivers fresh, creative dishes that are full of flavor. The restaurant’s wood-burning grill is the focus of the menu, featuring top-quality steak, chicken and tasty flatbreads. Savor signature Mediterranean dishes, pasta and steak, set against the stunning backdrop of Lake Bellagio. 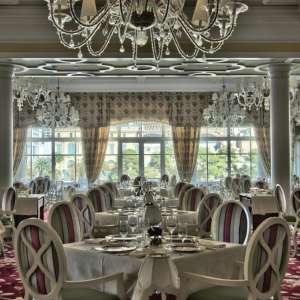 Experience the timeless experience created by charismatic restaurateur Sirio Maccioni and savor impeccable French cuisine. 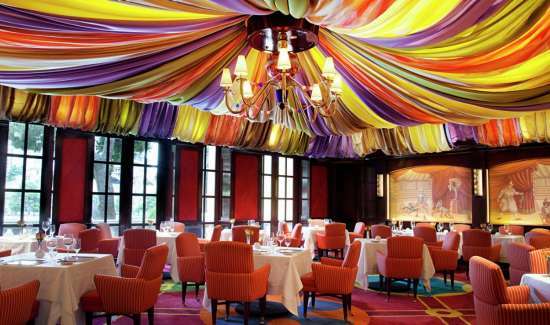 A coveted wine list and attentive service complete an evening at Le Cirque. At this signature restaurant, Michael Mina has created a menu from seasonal produce along with Japanese and French influences. This Michelin-awarded restaurant features French and Spanish influenced cuisine. 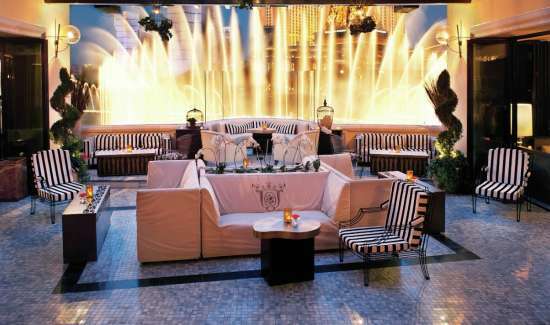 Guests may dine outdoors overlooking the Fountains of Bellagio. Enjoy American Café favorites in a light and airy space overlooking the resort’s Mediterranean-style pool and the flora of the Conservatory & Botanical Gardens. 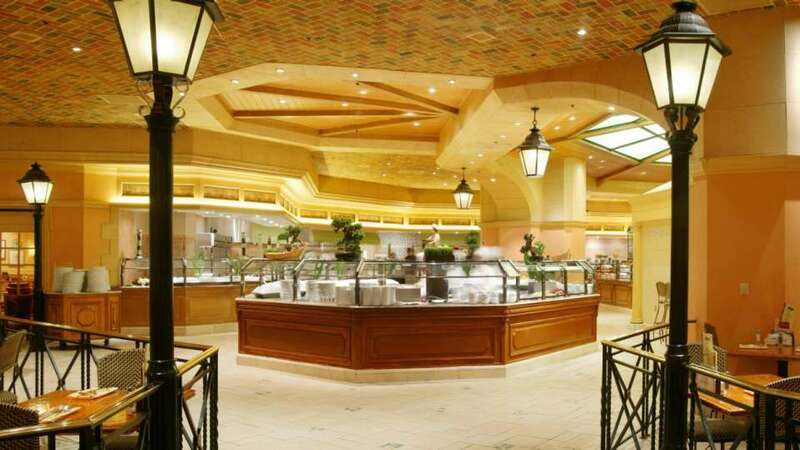 Visit The Buffet at Bellagio for a unique experience. Enjoy the best dishes from around the world, including Italian, Japanese, Chinese and American cuisines. Carefully crafted collection of chocolates, cookies, cakes, crepes and other delights. 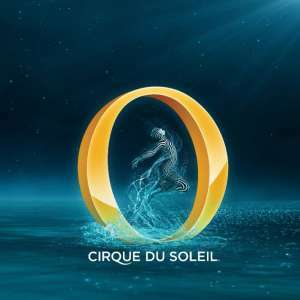 Cirque du Soleil weaves an aquatic tapestry of artistry, surrealism and theatrical romance in the timeless production, “O”. The international cast of world-class acrobats, synchronized swimmers, divers and characters perform in, on and above water to create a breathtaking experience in a magnificent theatre reminiscent of a European opera house. Each season, the talented horticulturalists and designers who make up the Bellagio Conservatory team transform the 14,000-square-foot floral playground into a showcase of the distinctive sights and colors of spring, summer, fall and winter—along with a special display for Chinese New Year. Take in a spectacular show of water, music and light designed to captivate. Step back, or find a comfortable perch to sit, and watch the dynamic performance set against the backdrop of the dazzling Las Vegas sky. Bellagio Gallery of Fine Art is a premier exhibition space. Enjoy intimate exhibitions featuring works by some of the world’s most captivating artists. 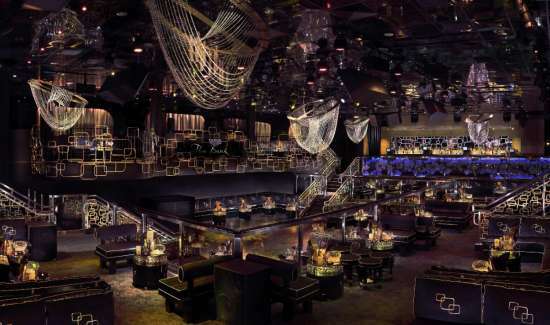 Hyde is an indoor-outdoor nightclub with a terrace overlooking the Fountains of Bellagio. Beginning at 5 p.m., enjoy an award-winning mixology program and a menu of intriguing small plates from Lago. Vivid custom-designed ambient and mood lighting on both the ceiling and floor create an ultra-sensory experience and a state-of-the-art sound system brings the club to life every night. 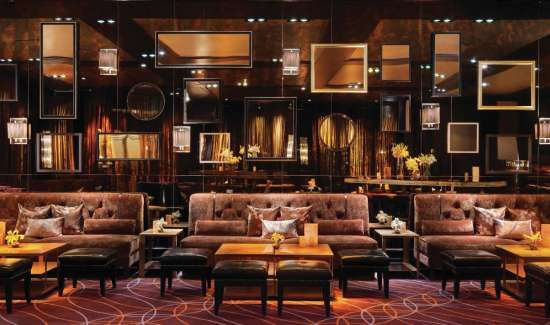 The Lounge at Baccarat Bar features a view of casino action as well as a glimpse into high-end gaming. 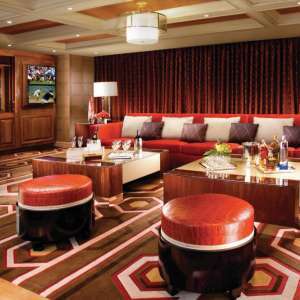 Enjoy a variety of martinis, specialty drinks and an extensive cigar selection. Imported Spanish stone tabletops and plush community-style ottomans, create a sleek, sophisticated environment. Enjoy seasonal cocktails crafted by a true master mixologist, as well as inspired music mixed by top DJs. Traditional Afternoon Tea Service is from 1:00 p.m. - 4:00 p.m. Enjoy open-faced sandwiches, English tea sandwiches, freshly baked scones with clotted cream, Baxter's preserves, assorted miniature pastry delicacies, as well as teas imported from around the world. 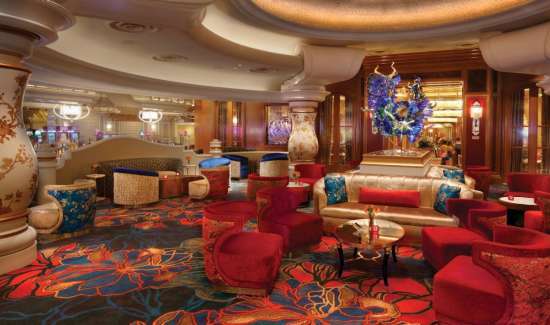 In the evening, listen to live music from the Steinway grand or relax on one of the couches with a view of the casino. Sports Bar Lounge, located next to the Race & Sports Book, stocks a wide selection of microbrews and traditional beverages. Watch you favorite sports on state-of-the-art TVs. Earn rewards at M life resorts for every dollar you spend - from hotel and entertainment to dining, spa and gaming. 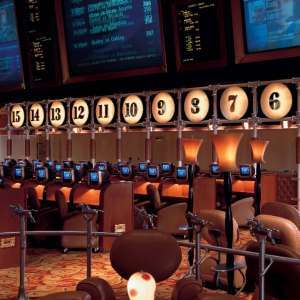 The Bellagio slot floor features over 2,300 reel, video reel and video poker games. The Bellagio casino hosts Slot Tournaments with live entertainment, and prizes ranging from $100,000 to over $2 million. 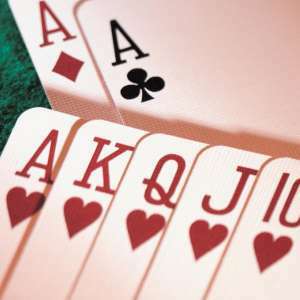 This high-stakes poker room pays tribute to its namesake, Bobby Baldwin, the 1978 World Series of Poker Champion and Chief Design & Construction Officer, President & CEO, CityCenter. 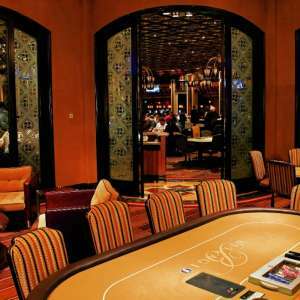 The Bellagio poker room is one of the stops on the famed World Poker Tour. The 7,000 square feet space is home to 40 tables and two high-limit areas. This smoke-free poker room features 24-hour tableside dining, complimentary beverage service, safe deposit boxes, a full-service cashier cage, an overhead state-of-the-art music system, eight 32" television monitors, and 11 42" plasma screens. The Bellagio Hotel Las Vegas Race & Sports Book features 99 individual racing monitors, 7 large screens for racing, 6 large screens for sports, 38 sports bar flat screens plus other screens in strategic locations throughout. Plan on making restaurant and spa reservations before your stay – last minute reservations can be hard to book.